My November empties is epic so I have split it into two-this post will be skincare and I will post a make up empties post tomorrow hopefully. I seemed to finish up so much this month! It will come as no surprise to regular readers to see the Garnier Soothing 2 in 1 make up remover and Simple eye make up remover. These are two drugstore brands I repurchase over and over. I use the Garnier to remove my mascara and eye make up first before cleansing and then the Simple to remove any remaining smudges after cleansing as it does not leave a greasy residue. They're always in my stash! Elemis kindly sent me their White Flowers Eye and Lip Make-Up Remover to try and I was seriously impressed with the formula. I reviewed this in full here but I was pleasantly surprised how effective at removing stubborn mascara it was without rubbing or tugging at the eyes. The Ren Clearcalm Clarifying Clay cleanser was my morning cleanser. I like Ren products and this cleanser is designed to be both purifying and antibacterial to help prevent breakouts. Key ingredients are french clay to absorb excess oil, Zinc Gluconate to reduce the production of sebum, Salicilin for its antibacterial qualities and Manuka Honey to soothe and protect. I only needed one pump of this cleanser so it lasted around 6-7 weeks. I was worried it might be drying because of the clay base but it wasn't at all. I used the Astalift Gentle Make Up Remover Gel as my 'first cleanse' in the evening which is always my make up removing cleanse. This is a bright orange, non sticky, no foaming gel that you massage into a dry face and then wash off. The tube it came in seemed to 'over dispense' the product and no matter how gently I squeezed it, too much product came out. I thought it was ok at first but soon realised it wasn't that good at removing make up and a second cleanse was absolutely essential. My opinion of it went down even further when it ran out and I switched to the Clinique Take The Day Off balm and I saw how effective it was at removing make up-it put this cleanser to shame. Glamglow is my favourite mask of the year! I love this stuff and had great skin when I was using it. I did a rave review of it here giving you all the deets! Another mask I loved this year was the Caudalie Vinoperfect Enzymatic Peel Mask. This is a thick white cream packed full of ingredients to add radiance to the skin. You can read my full review of it here. I got 7 applications out of this 50ml tube. The Bath and Body Works Coconut Lime Breeze body scrub is a very scrubby scrub, tightly packed with coarse granules, reminiscent of sugar in water. It's more lime-y than coconut-y but I really like this abrasive scrub. Perhaps not suitable for sensitive skin but perfect for a once a week exfoliating sesh for me. I also finished up two key items from my morning skincare routine. First up was the Caudalie Vinosource Moisturizing Sorbet. I really really loved this moisturiser. It's light and non greasy which I think my skin prefers, even though it is subjected to humidity and air conditioning every day. It contains grape water and chamomile so perfect for sensitive skin. I think I liked it as much as the Elemental Herbology Moisture Milk. The 30ml tube lasted me 6 weeks. I also finished up by Estee Lauder Idealist serum. I have seen criticism of this serum for being heavy on the silicone but I loved the texture and the illuminating skin effect. It seemed to reduce redness and almost give a soft focus to the skin. It is silicone based hence the velvety feeling but because silicone makes a decent base for anything else you put on top of it I find I need a lot less moisturiser. Finally I finished up two absolutely gorgeous candles from Bath and Body Works. The throw on these candles is incredible, filling our whole living area. Neither of them were overly sweet, the apartment just smelt so cosy and homely. I have repurchased both!! Well done if you've managed to read the whole post and thanks for sticking with it! 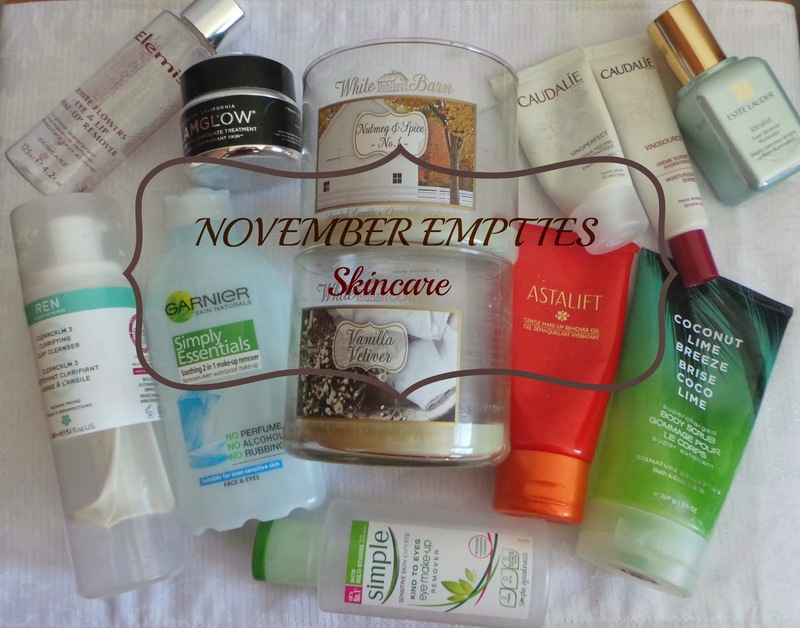 What did you use up in November?